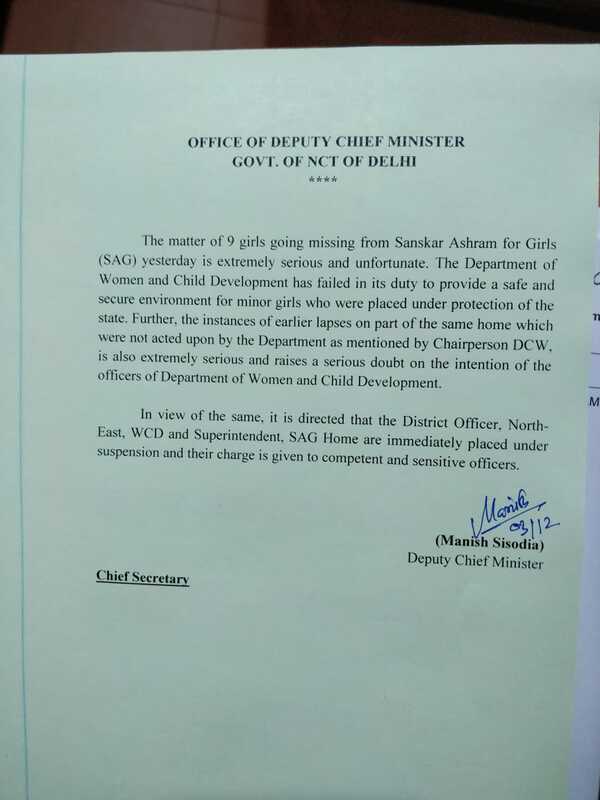 Delhi Government today suspended two senior officials of the Women and Child Development Department (WCD) following reports of missing of nine minor girls from a shelter home – Sanskar Ashram – in east Delhi. The action against the two senior WCD officials was taken after the matter was raised by the Delhi Commission for Women (DCW). The DCW also demanded that the case be immediately transferred to the Crime Branch of Delhi Police to ensure a high-level investigation into the matter. An FIR was registered by the Delhi Police on Sunday in connection with the case. In the letter, Sisodia said that the Department of Women and Child Development has “failed” in its duty to provide a safe and secure environment for the women and the minors who were placed under the protection of the state. Terming the matter as “extremely serious”, Sisodia said that it raises a “serious doubt” on the intention of the officers of the Department of Women and Child Development. “In view of the same, it is directed that the district officer, northeast, WCD and Superintendent, SAG Home are immediately placed under suspension and their charge is given to competent and sensitive officers,” the letter said. The DCW had earlier claimed that one of these missing girls from the Sanskar Ashram was found after six months on December 2 following which the case was registered. The DCW alleged that they were victims of human trafficking and commercial sexual exploitation and also suspected the hands of brothel owners in their kidnapping in “connivance with the Home authorities”. The women rights body demanded that the matter be probed thoroughly and recommended that the case be transferred the Crime Branch so that immediate action is taken on the matter.